Jonny Quest was hands down my favorite cartoon when I was a kid. I really wish I had more time this week, but C2E2 is looming. I'll be at ARTIST ALLEY table B6 all weekend. If you're going to the show, stop by and say howdy! Bandit will finally meet justice by Jonny's Machete. Just kidding, this is a great piece Andy! Love Dr. Zin's spider up there. That looming walking eye is GREAT, Andy. 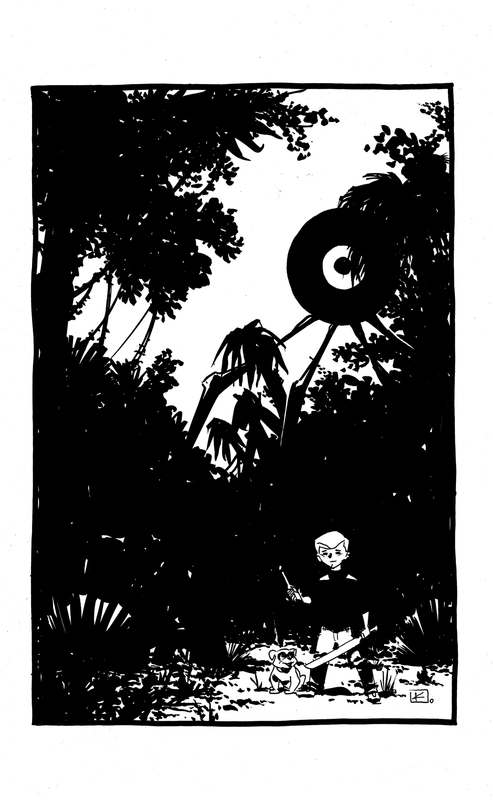 And Jonny with a machete is terrifying/awesome. Can you be any more perfect for a Quest comic!? DAMN, Andy!! Wow. Words cannot express how awesome this is. Beautiful. Have a great time at C2E2. Wow, man. This is surprisingly creepy! Glorious pic, though - love the composition/blacks. Love it, Andy! This may be my favorite post from you in a group of great drawings by you. Something about the subject matter this week is hitting home with you guys--it's really bringing out some superior work. It has a great lithograph feel to it. Well Done. I love the subtle aspects of this one. Brilliant composition!